"I can't believe what I just heard -- just let me savor that for awhile…"
"The first time I heard "The Crib in the Creche" I just cried and cried"
"I play this when I come home from work to relax"
When was the last time a song really uplifted your spirit? 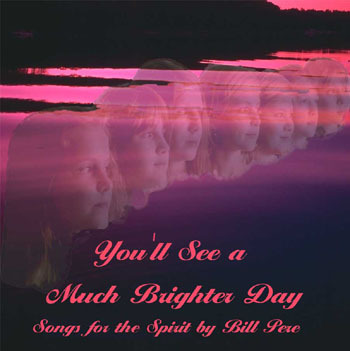 You'll See a Much Brighter Day is Bill's first collection of songs for the spirit, with inspirational lyrics, soaring music, and harmonies by the LUNCH Ensemble. The tracks are orchestrated with Bill's distinctive full band arrangements featuring 12-string acoustic guitar and Midi guitar, to support the powerful lyrics. a power far greater than ourselves. 11 Tracks, 49 minutes, Lyric Sheet Included ! You'll See a Much Brighter Day is part of Bill spiritual collection, which also includes "New Day Coming Tomorrow"", and "A LUNCH Ensemble Christmas"